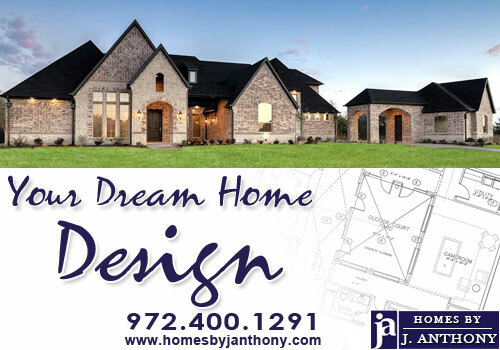 Welcome to Homes By J. Anthony – North Texas Premier Custom Home Builder, where we offer unique solutions and personalized service to each of our clients. We understand that one of the largest investments that you will make in your lifetime is a new home. Building a new home is a journey that we have proven success to provide you with the utmost customer service and quality. ​Tony Prutch, offers over 20 years of experience in the home-building industry and has a portfolio of award winning designs recognized by the Homebuilder Associations of North Texas. His uniquely extensive architectural background offers clients a personalized one-on-one experience and a seamless process from the architect to builder. It allows the client to custom design the plan to fit their needs while being able to draw plans and make revisions during the appointment, avoiding any delays in the design process. ​At Homes By J. Anthony, our construction team works tirelessly to hand-pick the finest subcontractors, suppliers and artisans to ensure each home is built with great skill and quality materials. Build with J. Anthony and experience the sensation of Living Beautifully. 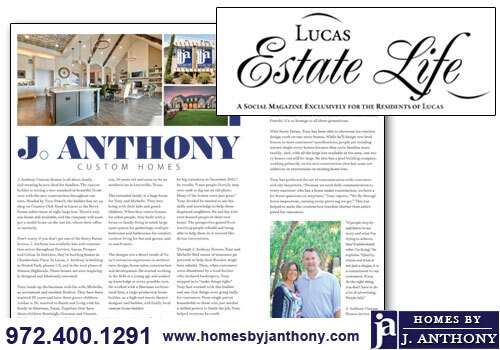 In July 2018 Homes By J Anthony was featured in Lucas Estate Life Magazine. Lucas Estate Life Magazine is a private, social publication exclusively for residents of Lucas TX. The magazine highlights the incredible families, kids, pets, stories, events, etc. that makes Lucas community special. over cash to dig out an old photo. WHY CHOOSE HOMES BY J. ANTHONY? Build on Your Own Lot or select from one of our many beautiful homesites. Homes By J. Anthony is one of the largest provider of Premium Lots in Collin County. Currently building in Lucas, Fairview, McKinney, Allen, Heath, Rockwall, Prosper, Frisco, Carrolton, and now Celina. Homes by J. Anthony also builds on “Your Own Lot”. Each Design starts with the customers vision and is translated to paper. The state of the art computer aided software translates your concept into 3D model so you can visualize your New Dream Home before it is constructed. Homes By J. Anthony start with a huge selection of the best materials and standard features so you have the freedom to choose and peace of mind in knowing you can select the best without paying premiums for material that should be included. Utilizing today’s innovative technology, Homes By J. Anthony communicates with you with an online application keeping you updated on the progress of your home and keeps the plans, schedule, and options at your fingertips. 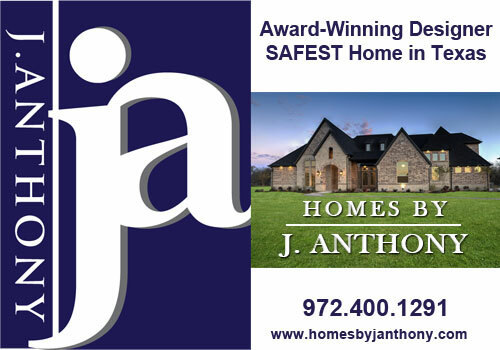 HOMES BY J. ANTHONY IS BUILDING THE FIRST PATENTED BASEMENT DESIGNS IN ALL OF TEXAS!!! With today’s technology, the basement in Texas is now complete and can be visited in our Model Home. Homes By J. Anthony offers you the opportunity to build your pool while your home is being constructed. No more worrying about messing up the sprinklers, yard, and landscape. You will save money and know that the work is completed correctly and will be warranted with the rest of the home. Schedule an appointment with Tony Prutch of Homes by J. Anthony to begin the process of designing your dream home!